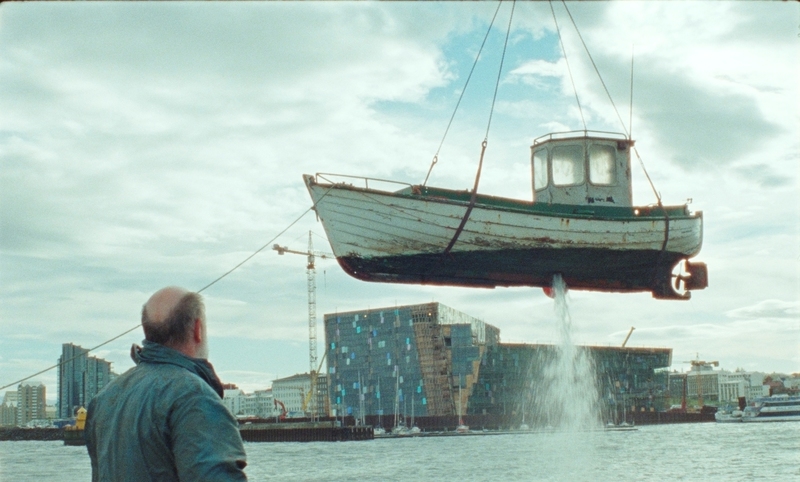 Hannes watches as the boat given to him by his father is lifted from the water with the hole in its hull clear for all to see – a metaphor for Hannes’ state of mind? Volcano is a recognisable Nordic drama, harrowing in parts and occasionally uplifting – never sentimental, always intelligent. As several trade reviewers jokingly put it, this isn’t a ‘date movie’ – but for older audiences it will ring very true or perhaps start some re-evaluations of family relationships. At the beginning of the film Hannes is experiencing the pain of his last day at work, aged 67 and after 37 years as a school caretaker and before that as a fisherman living in the Vestmannaeyjar archipelago. The 1973 volcanic eruption of Eldfell forced him to move the family to the mainland. Retirement does not come easy and it’s clear that for some time Hannes has become estranged from his wife and family. On a topical note, his daughter Telma has just been promoted as a loans manager in a bank – to the disgust of her father. His son Ari is divorced, but usually has his small son in tow. Most long-suffering is Anna, the matriarch of the family. After nearly sinking in his old fishing boat, Hannes begins to soften and he and Anna have a rapprochement – which is almost immediately halted by tragedy when Anna has a very severe stroke. What follows is a deeply moving study of how Hannes comes to terms with what life has given him. Written and directed by Rúnar Rúnarsson as his first feature after several shorts, the film is a remarkable achievement for a young man in his thirties. Part of a Danish film initiative the film was shown in Cannes in 2011 and has won awards around the world. I wish I’d seen more Icelandic films because the handfull I have seen do have several recurring elements such as choral singing, windswept landscapes and of course, the sea. Although the film is essentially social-realist, there are many symbolic references and at first I assumed that the title refers to the two devastating events that change Hannes’ life so dramatically. At the end of the film he will find himself back in ‘the islands’ as he calls them – perhaps wondering if he should have returned earlier. I’m also wondering if the couple’s favourite ‘halibut soup’ means more than just a tasty dish. Googling it suggests that it is one of the oldest Icelandic dishes – here’s a recipe. In an interview available here, the director says that the ‘volcano’ is actually Hannes himself, a seemingly cold and grey man with his emotions in tumult within about to erupt. Certainly he is a classically masculine working man in his dealings with others. The performances in the film are universally good and especially the lead couple, Theodór Júlíusson and Margrét Helga Jóhannsdóttir. Volcano is in competition at BIFF and alongside Arrugas it makes a strong case for films which deal with issues for older audiences, although there is no reason why they shouldn’t appeal to younger audiences as well. Can we have a UK distributor for this excellent film please?